My work is about seeing the beauty in the everyday world around us. I walk past this scene every day, and it is one of those scenes that always gets my attention; I knew I had to paint it. 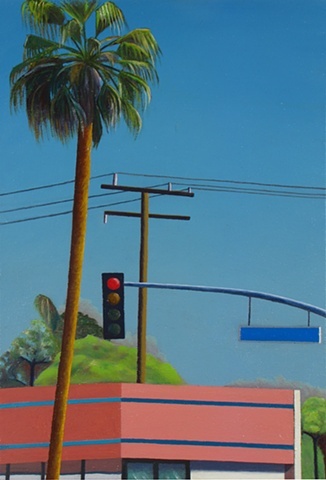 This painting began on location on Santa Monica Boulevard, but it really could be anywhere in Los Angeles, as this is a very familiar landscape to the residents here. The skyline often consists of palm trees, and telephone poles. They are very similar, with trunks being shades of brown to grey, columnar, arranged in patterns. Both palm trees and telephone poles were planted, neither being native to the Los Angeles basin. They rise above the city, unnatural, but natural at the same time. They become our urban forest, and they are beautiful.